It's happened again. Summer has just rushed by and I'm already seeing back-to-school commercials on TV (and starting to dread impending back-to-school traffic on my daily commute). But it's still blazing hot outside and the calendar does still say August... which means summer hasn't departed yet... which means easy fruit desserts are on my mind often. A quick detour on the state of my mind with respect to dessert: I'm a total sugar addict and can't get through the day without thinking about eating and making some kind of yummy, decadent dessert. I know, you'd never know it by looking at my In The Kitchen page, which is sadly underpopulated. But I'm trying to watch what I eat and writing a lot of posts about desserts and dessert recipes means making (and eating) a lot of desserts. So, not so many dessert posts so far. How do food bloggers (especially those focused on desserts) do what they do and not gain a zillion pounds? 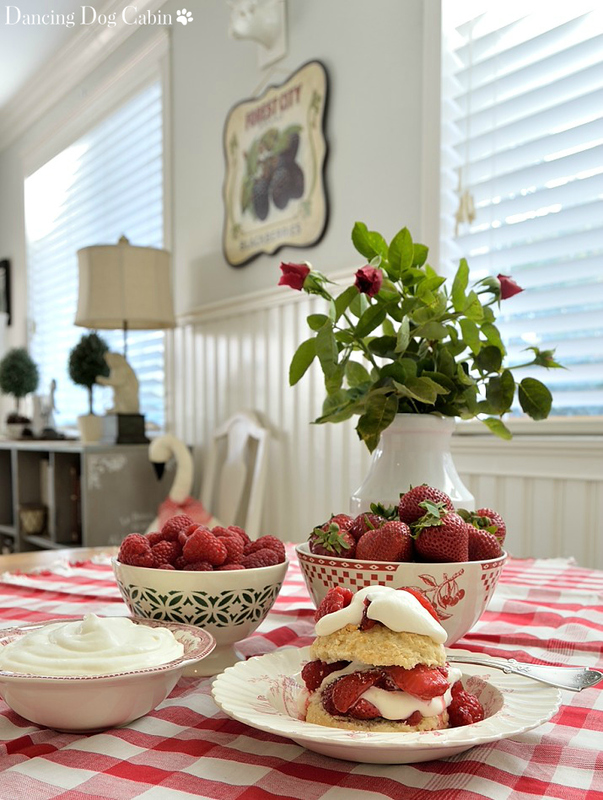 Anyway, back onto the topic of easy, summer desserts...and what is easier to throw together than berry shortcake? 3. Sweetened and whipped cream. I used strawberries and raspberries here. I would have used blackberries as well, for the extra bit of contrasting tartness and color, but the grocery store was out. Since fruit desserts tend to get better if they sit at least 12 hours, I think it's a good idea to macerate the berries with sugar the day before. This allow flavors to meld and intensify, and if needed, you can add a little more sugar to taste the next day before you assemble the dessert and eat it. ...so that it droops and drips very nicely around the berries and shortcake. 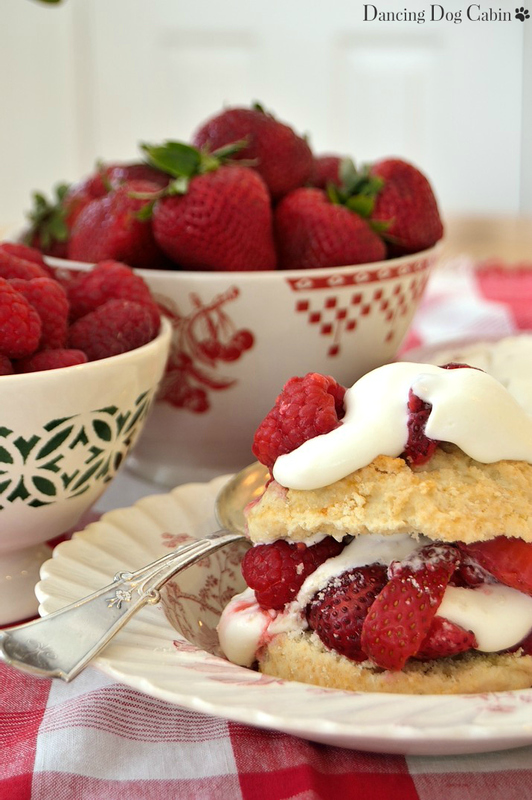 A yummy, crumbly shortcake adds just enough sweetness to complement the berries without competing with them. 1. Combine the strawberries and sugar and toss gently. Let the berries sit for about 30 minutes until they release some of their juice and very gently stir in the other berries (be extra careful with the raspberries, which tend to fall apart easily). As I mention above, it's a good idea to prepare the berries one day in advance, since the flavor improves with age. Of course you can use whatever combination of berries you prefer (including blueberries). After the berry mixture has sat for at least 12 hours, you can adjust the sweetness by adding more sugar if needed. How much will depend on how sweet you like it, and how sweet and flavorful the berries were to begin with. 2. Sift together the flour, 1/3 cup of sugar, baking powder, and salt. Add the 2/3 cup of butter. Using an electric mixer set at medium speed, mix together until the mixture is crumbly (up to 3 minutes). Add the eggs, one at a time, beating well after each addition. Gradually add the 1/2 cup of cream and 1/2 cup of butter milk, beating on low speed until the liquid is incorporated and the mixture is soft and thick (and not too wet). 3. 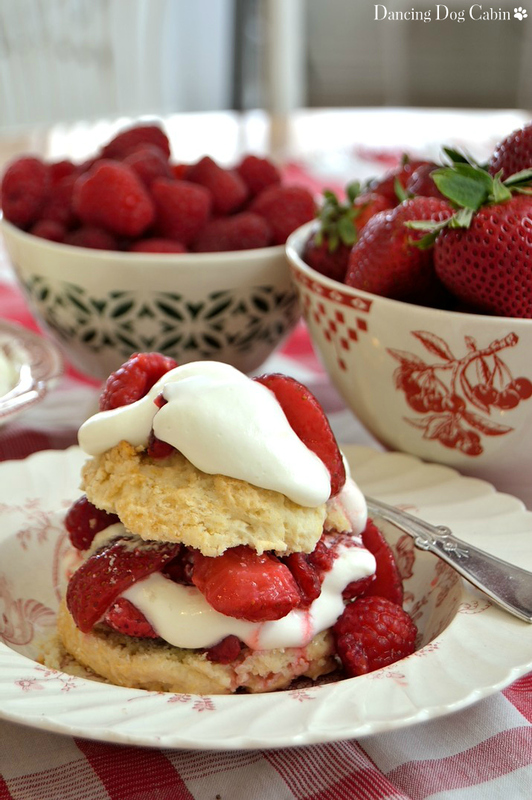 Use a 4-oz ice-cream scoop to form each shortcake. Pack the mixture so that it is even with the top of the scoop and release onto the prepared cookie sheet. Each shortcake should be about 2 inches apart on the cookie sheet. Brush the heavy whipping cream onto the tops of the shortcakes and sprinkle with the turbinado sugar. 4. Bake the shortcakes until a light golden brown on top, about 20 to 25 minutes. Remove the shortcakes from the oven and allow to cool on the cookie sheets set on wire racks for 5 minutes. Transfer the shortcakes to the wire racks and allow to cool completely before assembling the berry shortcake desserts. 1. Place the 2 cups of heavy whipping cream in a chilled bowl and beat with an electric beater, starting on the low setting and gradually increasing the speed. 2. When the cream starts to thicken, gradually add the powdered sugar until the cream is sweet enough for your liking. Add the vanilla, Beat until the mixture just reaches the soft peak stage. 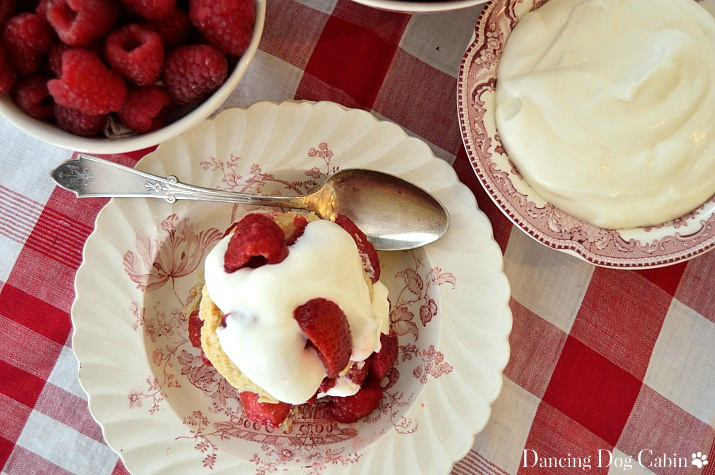 Chill the whipped cream until you are ready to assemble the berry shortcakes. 1. Cut the shortcakes in half. The shortcakes can be stored at room temperature for a couple days in a plastic storage bag. 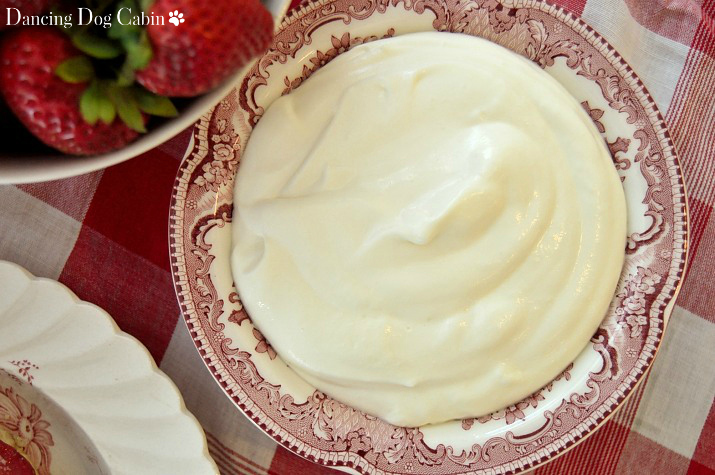 The berry mixture and whipped cream should be stored in an airtight container in the refrigerator. Now you have me craving strawberry shortcake. Thanks for stopping by and thank you for hosting SYC! ummm....my favorite dessert....and your photos are magazine worthy...just beautiful. YUM, I don't know which is prettier, the dessert or your tablescape. Looks fabulous! Oh, my goodness! I haven't had shortcake in ages and your beautiful, fun post has made my mouth water! It also made me think of my Granny. She always made strawberry shortcake every summer. Yum! Peach shortcake sounds fantastic! I'll have to give that a try. 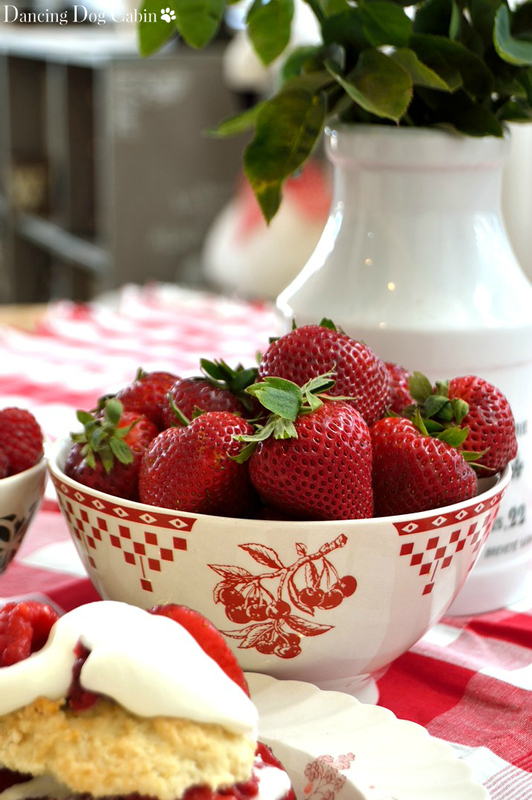 This is a perfect summer recipe, I love strawberries! I have never made strawberry shortcake actually, would love to give this a try! This is a very easy recipe to make! You should definitely give it a try if you love strawberries. One of my favorite summer time treats! It looks absolutely delicious!! I too have a huge sweet tooth and have to try and use will power. Notice I said, try? lol! I have that same cherry bowl and love it as well. Pinning and will try making the yummy biscuits. Thanks for sharing with SYC. Yes, I 'try' self restraint every day too, but usually have at least one small piece of chocolate. My mouth is just watering! So beautiful and I know yummy! I love the transferware plates/bowls you have in the photos! Thank you for sharing at Party in Your PJs! Hi Melissa, I'm Anne from Birdsong Bits and Pieces (https://birdsongbitsandpieces.blogspot.com), and I found you through the Amaze Me Monday blog hop. This looks delicious. 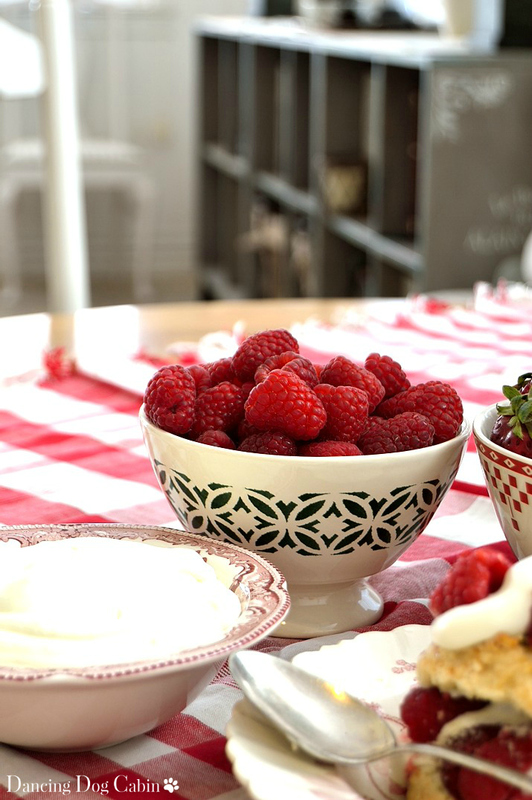 I never thought of combining berries like you did; what a fantastic (and yummy) idea. Thanks for sharing! Anyway, I just thought I'd take a sec to follow you and say hi. Have a great day! Anne, I'm glad you found me and thanks for following me! Oh, yum, Melissa! I love simple desserts like this! Your photos are fantastic! Thanks so much for linking up at Best of the Weekend! I'm sorry to see you haven't blogged since August. I hope everything is okay. I've just started catching up with my friends after coming back to Blogland a short time ago. Hi Rue, I don't remember where I got my bowls. I'm pretty sure it wasn't French Garden House though. Last year was a really bad year for me and my family so the whole blogging thing came to a grinding halt end of last summer. 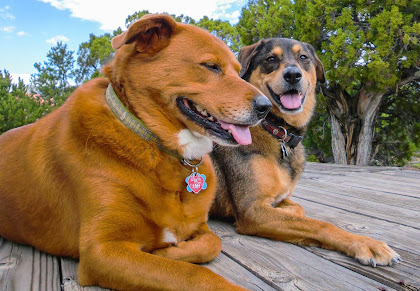 I'm actually working on a post about finally passing our final inspection for the cabin (it finally happened!! ), it's just taking me a while. I'm so glad you've returned to blogging-- I've missed you too! Gah! I thought maybe you had posted since your comment, darn it! I hope you do soon, my friend. Hi Rue, I'm working on it!